Caileadh Seán Ó Riada sa bhliain1971. Sa bhliain 1974 dheineamar ceiliúradh ar ócaid trí mbliana taréis a bháis. Bhí an coiste ceiliuradh sin faoi stiúir Cheabhail Uí Dhálaigh agus Ruth Uí Riada. Ar ócaid deich mblaina taréis a bháis bhí an dara ceiliúradh gí faraoir go raibh Cearbhail agus Ruth imithe uainn. Dála a Fhéile eile, bhí maithe agus mór uaisle na tíre i dteannta ann maraon le Uachtarán na hÉireann, Tánaiste, Airí is polaiticeoirí is cléir na tire. B’é téáma an Féile áirithe seo, an ceangal idir pór na gCeilteach sa Tír seo agus a mbunús san Ind maraon le gnéithe éagsúla an ealaíontora Seán Ó Riada. Bhí an tríú ceiliúradh againn ar ócáid fiche bliana taréis bháis Sheáin i 1991. Ar an ócáid seo do mhair an Féile aon uair a chloig amháin faoi stiúir an Taoisigh. “Criocha Amhalaiochta an Ealaíontóra” a bhí faoi chaibideal an turas sin. Sa bhlain 2011 sea tosnaíodh ar bunús faid téarmach do chuir leis na hócáidí seo agus ó shoin, fhillfigh an Féile gach seachtú bliain. Oireann dúinn an coincheap do leathanú leis ionas go ndéafam ceiluradh ar laochra eile an náisiúin ghaelaigh pé in Éireinn iad nó scaipithe ar fuaid na cruinne sa ‘Diaspora’. Teastaíonn uainn athbhuanú do dheineamh ar an ngaol atá idir na daoine agus a mbaile dhúchais ar an oileán seo, a stair, a n’oidhreacht agus iad a bhuanú trí mheann a n’ealaíontóirí ionas go mbeidh an Náisiúin forleathan seo, misnithe, buanaithe agus cóirithe dos na blianta beaga atá romhainn. Féile na Laoch is ainm don bhFéile anois is coiche. Ann bíonn seimineáir, taispeantaisí stáitse is sráide ins na módhanna éagsúla cruthaíoch dá chraoladh beo againn ar fuaid an domhain ón ócáid seo trí mheann an idirlinn, raidéó agus mar sin de. Beidh sé ina dhá chuid a chuirfidh tosach agus clabhsur le tréimhse ghinearálta ceiliuradh ar fuaid na tíre. Osclófar An Bosca Mór atá i dtaisce i séipéal Chúil Aodha ar an 1ú Bealataine de bhliain ceiliúradh. Istig ann tá na bratacha agus pictiúirí na 100 laoch a bhí ann sa bhFéile seacht mblian roimis sin. Tiosnáionn tréimhse ullamhúcháin a leanfaigh go tosach an Treimhse Féile a leanan trí mhí as san ar fuaid na tíre. Tosnóigh an cead tréimhse eile mar seo ar an Aoine an 27ú Iúil 2018 nuair a lasfar lóchrann a scoilfear in ísc ar an 7ú Deire Fomhair go ceann seacht mbliana arís.agus leanfaigh an céád babhta go dtí an coirm mór thar oiche ar an gCeadoin 1/8/2018). Críochnóigh an tréimhse Féile seo ar an gcéad deire seachatine Deire Fomhair le múcha an Lóchrann, ísleófar na brait is cuirfear i dtaisce go fileata is go ceolmhar, an 100 pictiúirí laochra Múscraí is Éireann agus na 49 bratacha spleodracha na Laoch”Coirm mhór an Dúnadh” na tréimhse ar oiche an Domhnach 7/10/2018. Ansúd, ar buille an mheann oiche tráth a bheidh an tairninge deirneach bualite isteach sa Bhosca Mór go cionn seacht mbliana arís. An oiche roim breacadh an lae ar Lá Lughnasa is ea príomh ócáid an Fhéile. Tá an suíomh lonnaithe i gCúil Aodha, an glean mar ar thóg na Tuatha Dé Danainn a seasamh deirneach im gcoinninbh na gCeilteach, ar bhruachaibh an tSuláin, an t-aon abhainn fireann sa tír. Gluaisfidh na h-ealaíontóirí agus na daoine faoi bhrataibh is mannaí an n-eagraiochtaí, ar nós Aosdána, Acadamh Fódhla, C.L.G, Ollscoileanna is a leithéid, maraon leis an bpobal, chun an tsuímh faoi stiúir bannai ceoil, Arna sroisint an láthair dóibh, scoilfear saor lampaí oiche chun spéir lena a gcuid guíonna is mannaí chun na dtohghachaí. Ansan ar an bPavailion beag a bheidh i lár an láthair agus le linn dul faoi na gréinne, tosnóigh sé dáimh cruthaíoch ag taispeáint a gcéird go buaic a gcumais. Beidh seachtar ealaióntóir i ngach Dáimh agus gan ach seacht neomat ag gach duine acu san. Beidh sos deich neomat idir gach uair, tráth a n’aistreófar an pavilion cúpla céim ó thuaidh agus chun sos chun ite is scíth do thabhairt don lucht féachanna. Seo é an t-órd ina reachtáilfear na dáimhibh; Reacairí, Filí, Aistreoirí, Amhránaithe, Rínceoirí agus Ceoltóirí. Tabharfaigh san an taispeántas chomh déanach le eirí gréinne Lá Lughansa tráth a sheinnfigh ceol fhóirne le chéile ceol Mise Éire de chuid Sheáin Uí Riada agus an ghriann ag eirí. Seán O Riada died on the 3/10/1971. In 1974 we had a festival to celebrate the third aniversary of his death. 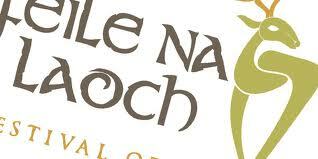 That Festival was under the direction of Cearbhal Dálaigh and Ruth O Riada. On the occasion of teh tenth anniversary alas both Cearabhail and Ruth had passed on. As with the foirst Festival, this occasion was graced by the great and noble of the country in the company of Ireland s President, Táiniste Ministers, politicians and clergy. That Festivals theme was the exploration of the relationship between Ireland and their Celtic ancestors from India as well as the many other facets of the arts that involved Seán O Riada. A third Festival was held on the occasion of his 20th anniversary in 1991. It was of one hours duration and again the Taoiseach of the day attended and gave witness on behalf of the Nation. This hour delved into the “Subconcious Territories in the Mind of the Artist” (Seán O Riada). For teh 40th anniversary in 2011 we initiated a Festival which returns every seven years. We are also broadening the concept to include heroes of the Gaelic Nation generally with Scottish and Worldwide Diaspora connections also represented. By pointing to the work of their creative artists, we wish to strengthen the identity and the link between these peoples and their original island home, their history and their heritage. We broadcast the events live on the World Wide Web and radio etc., the seminars, concerts, ceremonies and other aspects of this festival. Every event is free to everyone. The trigger for this rare event is noon on Mayday and the Opening of the Bosca Mor (Big Box) which is held in Séipéal Chuil Aodha. This box has been nailed shut as the last act 7 years previously and contains the flags of 49 artists and the 100 portraits of heroes, these are released like butterflies from a box and starts a period of excitement and preparation. The period of Festival starts in the days leading into 1st of August – La Lughnasa, Seán’s birthday. Many artists travel long journeys to participate and highlights of these events are available on the Internet at the Festival web site. The Festival period continues nationwide until the official dousing of the Torch and the final concert on the first Sunday in October where, at the stroke of midnight and to the accompaiment of musicians and choirs, the last nail is hammered into the bosca Mór and the flags and portraits are locked up once more to be the material of dreams for the next seven years. This second weekend is indoors and focuses on the future with seminars and talks and plans. We want a space where plain talk is provided without fear, favour or politicking. Where the people can feel they are getting unvarnished information with which they will be able to make up their own minds as to how best to steer a course for themselves and their families in the next seven years as they deal with how to manage their wealth, children’s education, food provision and domestic requirements and those needs in those other two equally important areas of being – the spiritual and the creative. The main event of the whole period Festival during the first weekend and is the night leading into the dawn of August the first Lá Lughnasa. The site is Cúil Aodha in the valley where the Tuath De Danainn made their last stand against the Celts, on the banks of the Sulán, the only male river in Ireland. The artists and people will process behind the army and other bands and upon reaching the venue, as the sun sets, people will release their Chinese lanterns into the approaching night sky conveying their wishes to past and future. Then, centered on a small pavilion facing the setting sun, will start six hours, each dedicated to a different muse in this order: Reacaire (Story telling which today includes storytellers, journalists, writers of all kinds,) Poetry. Acting, Singing, Dancing, and Music. Each class will be represented by seven of the best of their kind who will each have seven minutes to show their artistic discipline’s greatness. There will be a ten-minute break after each discipline during which the small pavilion upon which they have performed shall be turned sun wise a few degrees, the last turn bringing it to face the rising sun. As the sun rises, combined volunteer orchestras will play the opening sequence of Mise Éire. The sportsmen will be called down from the moutain by the blaring horns and shall arrive to perform seven feats as portrayed in our ancient sagas.